If you don’t already know about all of the benefits of drinking green tea, here are a few of the highlights. Green tea has been a large part of the Japanese people for centuries and it’s quickly clear that there was a very good reason for that. With its many antioxidant properties (catechins, in general and EGCg, in particular), green tea can help promote healthier skin and vitality. It can also increase energy levels, burn calories, and detoxify the entire body. It calms you down while also boosting concentration and memory because of the L-Theanine in it (which aids in the production of serotonin and dopamine). If all that weren’t enough, matcha green tea helps reduce bad cholesterol levels while also fortifying the immune system. Anybody who hasn’t actually tried matcha green tea might think that, if it can do all of that, it can’t possibly taste good, right? Wrong. It tastes great. Try a cup and see for yourself. However, the best thing about matcha green tea is that you can use it in a number of tasty recipes so you can get even more of those benefits while enjoying some yummy foods as well. 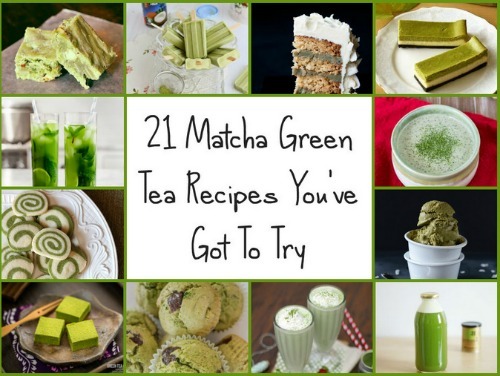 We’ve tracked down a fantastic website that details several tasty recipes that use matcha green tea and teaches you how to integrate the powder into various recipes to include the powerful antioxidant properties into you daily diet. Some of the culinary highlights include cakes, muffins, brownies, and protein bars. You can also create cold treats that include ice cream, milkshakes, and popsicles. You can also make all kinds of slushees, energy drinks, iced tea, chocolate, cookies, and so much more. Best of all, they all have antioxidant properties and promote good health. It adds such a high value to know that a tasty dessert can add so much to you health to boot.